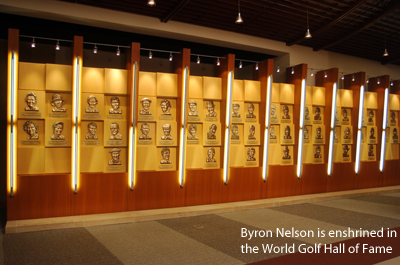 Next year marks the 70th anniversary of Byron Nelson’s never-to-be-equaled 18-win season that included an incredible eleven consecutive victories. It remains an amazing accomplishment, one not even Arnold Palmer, Jack Nicklaus, Tiger Woods or any other player has ever even approached much less surpassed. An oft repeated myth of “Lord Byron’s” demonstration of near perfection was he played against fields of second rate competition since all the top players were away in the service. However like a lot of myths this one is just not true. Superstars Sam Snead and Ben Hogan had both been released early in the year from the military and were actively competing throughout 1945, Snead playing in 26 events and Hogan in 18. But there were lots of other prominent players teeing it up each week who Nelson consistently beat such as Harold “Jug” McSpaden, Denny Shute, Toney Penna, Leo Diegel, Ky Laffoon, Johnny Revolta, Mike Turnesa, George Low and Dutch Harrison. Because of the war, prize money was often in war bonds or a combination of war bonds and cash. So even though he “officially” won over $60,000, when he converted the war bonds to cash his income tax return for the year showed less than $48,000 augmented by another $4,000 from exhibitions. Putting this in perspective, with prize money equivalent to today’s Tour his total would have been in the range of $20 million. Think about that for a minute. Tiger Woods had a five win 2013 season and took home $8.5 million. This past regular season Rory McIlroy won three times for just over $8.25 million. Also remarkable and bordering on the unbelievable was Nelson’s scoring average of 68.3 for 1945 especially given the relatively poor condition of courses back then. By comparison for the 2013-14 PGA Tour season McIlroy’s 68.8 average took the scoring title meaning Nelson’s was lower by more than half a stroke per round. Everyone has heard the story Nelson pushed himself during 1945 so he could earn enough money to buy his dream…a cattle ranch. What is not well known, and no myth, is Nelson desired with no little passion to set records, records to firmly establish his name in the history of the game though in his typically modest fashion he didn’t reveal it publically until his 1993 autobiography. With his 1945 winnings the following spring he took an option on the $55,000 purchase price of a spread in Roanoke, Texas he named Fairway Ranch and moved there in August with his wife, parents and brother. Shortly after the move as everyone knows “Lord Byron” announced his retirement from tournament golf. Finally, and in case you are thinking the “streak” was simply a fluke, over Nelson’s 75 starts from 1944 through 1946 he posted 34 wins and 16 second place finishes. Plus and almost as unbelievable, he finished in the top ten of every one of those tournaments except for the 1946 Pensacola Open managing only a tie for thirteenth.